Colombo Theatre Forum, a platform created for those who are seeking new dimensions in Sri Lankan theatre will have its latest event ‘The Dramaturge’ on October 31 at the Goethe Institut Hall from 5.00pm onwards. Organised by Inter Act Art theatre and Goethe – Institut Sri Lanka, the evening will include screening of a documentary film and a discussion on ‘The Dramaturge’ or the art of disappearing in theatre. The curator is well-known playwright M. Safeer. The Dramaturge is a special feature of the German-speaking theatres. No other theatre has established the dramaturge with such an important role, except some single theatres, which were following the German model, like in France for example. This profession has its roots in the eighteenth century in the Age of Enlightenment, where theater became an educational, or as the young Schiller said, moral institution. It was able to develop around the turn of the past century, only in the unique system on princely, later urban and then state subsidised stages. The contribution of the dramatist, the actor, the director, the stage designer and even the soufflé use is obvious. But what does the dramaturge? This question is not only asked again and again by the audience, but also often (and polemically) in the theater itself. Seven prominent representatives of this little-known species give information in the film. 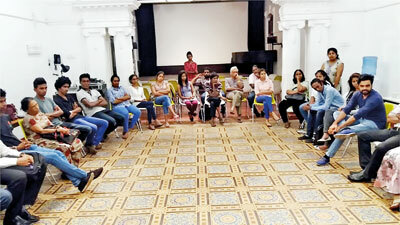 Colombo Theatre Forum was recommenced last July with the participation of many young theatre lovers and foreign delegates and the forum will be held every last Tuesday of the month. Scholars, directors, script writers, actors and actresses, critics, lighting directors, back stage creators, stage managers, students and spectators are welcomed for the forum as it would help widen their horizons in the field of theatre.